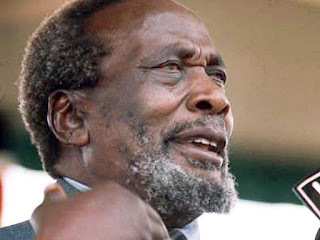 Wednesday August 22, 2018 - The founding father and the first Kenyan President the late Mzee Jomo Kenyatta may be turning in his grave 40 years after his death. This is after it emerged that his family, which includes President Uhuru Kenyatta, failed to honour his dying wishes to bury him at the Coast. This was revealed by 88-year old Enock Ondego, who is now blind and living in a destitute life in Mtopanga, Mombasa County. According to Ondego, Mzee Kenyatta took him to many tours, especially in Msambweni. And months before he died, during a live musical performance by the defunct Mwakigwena Choir, Mzee expressed his wish to be buried at the Coast. He noted that it was a mistake to bury Kenyatta in Nairobi instead of Coast and that there may be consequences as a result. “It was a mistake to bury him at Parliament in Nairobi and yet Mzee had expressed interest to be buried in Msambweni,” Ondego said. The old man revealed that Mzee hated Nairobi with a passion, especially during his last days, and that it was a mistake to take him back to Nairobi after his death. ‘He wanted to be in Mombasa most of the time,” he said.